No advisories have been issued for the impending snowfall, although visibility and traction may be an issue for the Garden State early Friday morning. The cold air has returned! And a brisk wind is driving wind chills into the teens for part of New Jersey early Thursday morning. 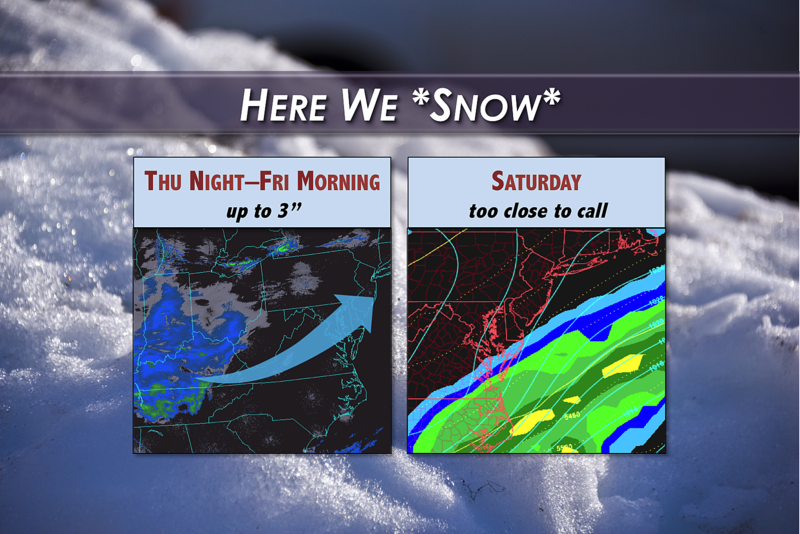 Our attention now turns to two storm systems aiming for New Jersey over the next three days. The first will produce minor snow accumulations. The second is just too close to call at this time. High temperatures on Thursday will be limited to the mid 30s - a far cry from the mid 50s we enjoyed on Wednesday. The cold wind will remain rather fierce for at least the first half of the day. Skies will be partly or mostly cloudy, with a stray snow shower or flurry possible. WHAT? A weak storm system will brush past New Jersey late Thursday night through Friday morning. Although this system is on the weak side, temperatures will be cold enough to produce a period of light to moderate snow overnight. For part of the Garden State (i.e. South Jersey), this will be the first snow accumulation of the year. Possibly enough to necessitate shoveling. And probably enough to cause a snowy/icy Friday morning commute. ADVISORIES? As of this writing, no advisories or warnings have been issued for this system. While I'm a bit surprised, given the 2 to 3 inches forecast along the coast, the lack of an advisory illustrates what a minor snow event it's going to be. Just "pretty snow" or "nuisance snow". WHEN? Don't be surprised if you see a few flakes flying around Thursday afternoon or evening. The "main event" will push into the state after 7 p.m. Thursday. The heaviest period of snow will likely occur overnight, around 3 or 4 a.m. (give or take). Snow should exit the state by about 7 a.m. Friday. HOW MUCH? We're holding steady with our previous forecasts. Up to 3 inches of snow accumulation will be possible along New Jersey's southern coast - that's Ocean, Atlantic, and Cape May counties. Areas along and southeast of the NJ Turnpike are expected to see 1 to 2 inches of snow on the ground by Friday morning. For the rest of the state, at least a coating to an inch of snow is expected. IMPACTS? Please be very careful if you're going to out and about late Thursday night through early Friday morning. If snowfall intensity increases from light to moderate overnight, visibility could be an issue. Snowy and/or icy roads will potentially make for slippery driving conditions through Friday morning's commute. Use extra caution on untreated side streets, bridges, and overpasses. Keep in mind, with cold temperatures and limited sunshine, the snow will likely remain on the ground through the weekend. CONFIDENCE? I feel good about where our forecast has landed, and the "minor snow" messaging we have used so far. I've met my usual benchmark for snow forecast confidence: I feel equally good that the forecast could be too low and too high. In other words, there is a (slight) chance that the storm system underperforms, and we only see a widespread inch. And there is a (slim, but nearly equal) chance that snow totals will be higher than forecast - perhaps up to 4 or 5 inches along the coast. WHAT? A stronger storm system will cut across the mid-Atlantic states, potentially dropping double-digit snowfall around Virginia and North Carolina. The storm is then expected to curve northward to parallel the Atlantic seaboard, and that's where the forecast becomes just too close to call for New Jersey. Our current forecast (and model consensus) calls for a near-miss, keeping the bulk of the storm (and the snowfall) south and east of the Jersey Shore. However, if the storm track wiggles just a few miles, South Jersey and the southern coast could ultimately experience healthy snowfall at some point Saturday. WHEN? Good question. Other than saying "sometime Saturday," there remains a variety of timing scenarios for this system's impacts. Daytime (mainly midday) looks most likely, but previous model runs have shown more of an evening-nighttime pass-by. HOW MUCH? Great question. 0 to 8 inches. Again, at the moment, we are leaning toward 0. (Leaning heavily towards nothing for Central and North Jersey.) However, we can't ignore previous model runs that have suggested up to 8 inches of snowfall along New Jersey's southern coast. Whether or not it snows on Saturday, the deep freeze will be here to stay through the first full weekend of the year. In fact, our forecast calls for temperatures to literally stay below freezing all weekend long. Saturday's high temperature will only reach about 30 degrees, with a stiff northwesterly breeze. Cloud cover will be directly related to how close the aforementioned coastal storm system passes to New Jersey. If it stays away, skies should feature at least some sunshine. Sunday looks mostly sunny. It also looks like the coldest day of this stretch. Morning lows in the teens. Afternoon highs in the upper 20s. Brrr. Temperatures should moderate through the early to middle of next week. We'll hopefully pop above normal by Wednesday.